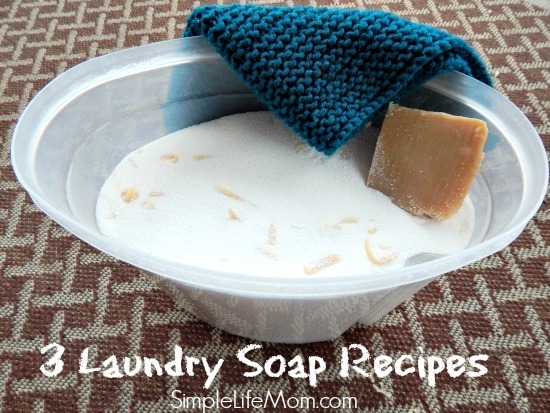 I’ve put together 3 Laundry Soap Recipes. I have not called them detergent recipes, because detergents are surfactants, which I do not believe are healthy. Instead, here are some healthier options for you and your family. Cost. It is a lot cheaper to make your own. Safety. Store detergents are filled with optical brighteners, synthetic fragrances, dyes, surfactants, and lots of other harsh chemicals. They have been blamed for effecting all kinds of health issues. When cleaning, it’s all about temperature and ph levels. Washing Soda (Sodium Carbonate or sodium salt of carbonic acid) is basically the same as baking soda (Sodium Bicarbonate) except that the molecules are larger. These larger molecules will help clean your washing load better. It will also absorb all odors. It is highly alkaline, but water helps to neutralize it (Which helps to soften water). Scientifically, it stops magnesium and calcium ions from bonding. It also neutralizes the acidity of chlorine in your water. Like any other powder of this sort, you don’t want to breathe it in. Borax (Sodium Borate) is also an analyzing agent that has been used for thousands of years. It breaks down some of the water molecules in your washing into hydrogen peroxide. Borax does its job better in hot or warm water. Soaps are used in some recipes. Make sure you use a pure soap. Soaps are made through a chemical reaction between fats and sodium hydroxide. Basically, the sodium hydroxide is neutralized as it changes the fat molecules into soap molecules. Then, by curing, the process can complete until the soap has a neutral ph level. The soaps add an extra cleaning power to your laundry soap. Use: Add 1/4 cup to your washing load. Add 1/2 cup vinegar in rinse (optional). Use hot water on whites. Grate the soap finely (harder lard soaps are easier to grind). Add equivalent of washing powder. Use: 1/4 cup per load. Add 1/2 cup vinegar in rinse. Use hot water on whites. Place grated soap into a saucepan with 1 cup water. Heat on low and stir until melted. Fill a gallon jug half full with hot water. Pour melted soap, borax, and washing powder and shake until dissolved. Add enough hot water to fill each jug, shake and replace lid. I find it by the laundry detergent. They usually have Borax and washing soda right next to one another. 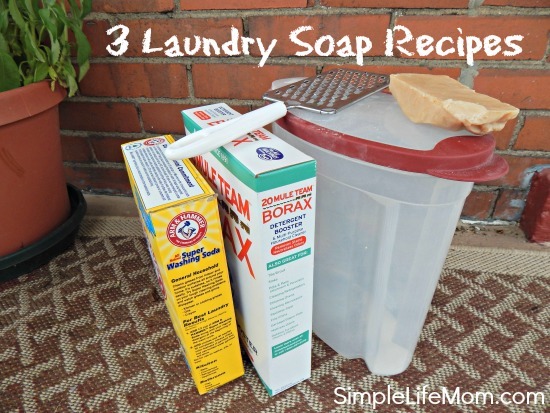 As for laundry detergent, you can make the liquid laundry soap without the borax. Thanks for the comment. Does the laundry powder #1 work well? I love that it only uses 2 ingredients that I can easily find. That’s all that I use. Just make sure you put it in first and let the water run a minute so there’s no white marks on top of the clothes…but I guess that’s with all dry laundry detergents. Is it safe in a high efficiency washer? As far as I understand, the only difference between HE detergents and others is the amount of bubbles. HE washers can’t take high amounts of bubbles. If that’s the only difference then this would work fine. My mother’s washer is HE and I wash my clothes with my own mixture every time I’m there without issue. I have a washing machine that recommends only HE (I believe it stands for High Efficiency) soaps. How does this translate when using homemade detergent? I’d very much like to make my own. Daniela, somehow your question got missed. Sorry about that. HE machines do not like lots of bubbles. The “special” detergents are just ones with less bubbling. Since these do not bubble much, they are great for HE machines. I remember the days of 20 muleteam borax detergent. I guess it is still around. I have been concerned about all the different detergents on the market used to be just one, borax. I am a soapmaker and I will try the detergent recipes. Great blog. Thank you Barbara. Yes, that’s the reason I got started making my own. That and the fact that it’s super cheap! I just started making my own laundry soaps, I love it. I do liquid, because it is easier in my top load machines. And every now and then, when I get lucky, one of the boys will run a load, whoopie! I taught them how with liquids, and I know they dissolve faster in the machine, so that’s what we use. Besides, making two gallons at once, is a whole lot less time consuming than a little bit at a time. Love your site. I just came across your blog today and I’m so impressed. Made the upside down pizza for dinner and it was great. Now I want to try your recipe for the liquid laundry detergent. My question is about the bar of soap. 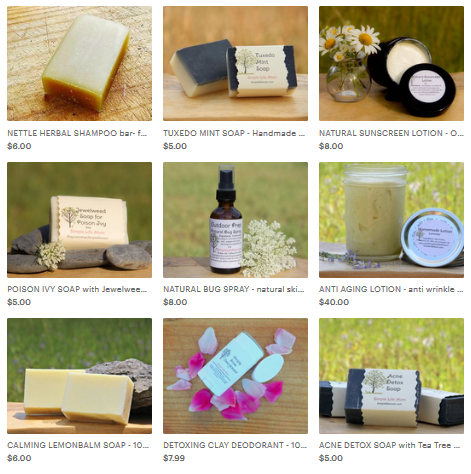 If I were to purchase a bar from your Etsy store, what type would you recommend and also what essential oil would you add? Just wondering…I’d like to do it right the first time. Also, do you have a store in Pittsburgh? We’re traveling there for Thanksgiving to visit my family and would love to visit your store if you have one.. Thanks! Great to hear from you! In regards to the soap, you can use any soap, but I prefer soap that doesn’t have herbs in it (so you don’t have to filter them out). I like to use the lavender bars, but any will do. I wanted to ask if the first recipe (baking soda and Borax) safe to use on color clothes and hand washables? I do and have no problem. This is so great and “green” chemical free! I tried making my own laundry detergent once. While I was very pleased with my efforts, I wasn’t too impressed with the way it cleaned the clothes. Maybe I’ll have to give your recipes a try. 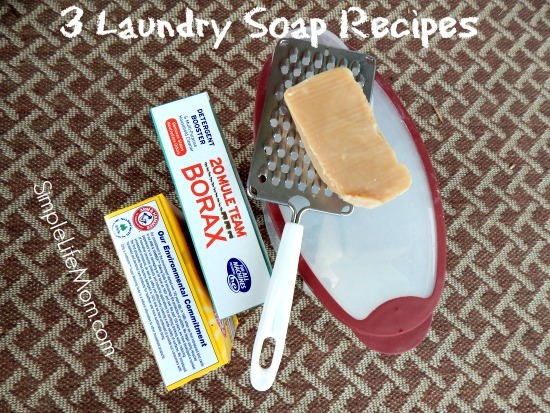 I made the #3 recipe for laundry soap. When I was reading information on the box of borax it says you can add this to your regular detergent. So I am wondering if the little amount of borax and washing soap that makes two gallons is sufficient enough to clean clothes. Please advise. Great question. Yes it is enough. Cleaning clothes, scientifically, involves changing the hardness of the water and causing the dirt molecules to release from the cloth. Changing the ph and hardness of the water is enough to accomplish this. Soap manufacturers these days go for bubbles, brighteners, perfumes, etc. But the science of actually just cleaning the clothes is pretty simple. The difference you may see over a year or so is your clothes not being bright, but that’s due to the lack of artificial brighteners. Borax is a water softener, as is washing soda. Neither is actually a detergent or true cleaning agent. Since detergents (which are mostly surfactants) are mostly toxic, it’s great to know that, chemically, the softening of the water loosens dirt molecules from the clothing. The only time you would need an actual soap to help do a better job is if you have oil on clothing. Soap will help to dissolve the oil into the water and wash it away. Oil does come from our skin (those lovely armpits too) and can cause clothes to look dingy over time without using a soap. That is why you can finely grate soap into your borax/washing soda mixture for extra cleaning power. I mention hot water because borax is much more effective with warm or hot water. You can definitely wash with cold water, but if you think the clothes are not getting as clean, switch to warm water. Is this okay to use with septic system? It breaks down just like other soaps do so I don’t know why it would be any different, but I don’t know much about septic systems. I have been using a recipe that calls for the same ingredients. I have been using liquid castile. My husband complains that the clothes smell funny. I have noticed it too. Could it be from the liquid soap? Maybe I will try it w/o soap. It’s hard to say without smelling them myself. Did you previously use a very strong scented detergent? You could just be smelling the water/soap/dryer combo scent without perfumes. You can always add a few drops of essential oils to a cloth and throw that in the dryer. I know it’s been a while since you posted this, but I was wondering if you’ve ever tried adding an essential oil for scent to #3? If so, how much? 2 gallons is a lot. I add 15-20 drops per gallon, depending on the essential oil. That’s enough to give it a light scent. WOW! I just made 2 gal of liquid laundry soap for $3.02. I will never buy laundry soap again. And my soap does not have all the harsh chemicals. Thank you so much. Can I use ivory bar soap ? You can use any soap bar of your choice, as long as you grate it very fine. O I made a batch of you laundry bars. can I use them in this recipe.? Would one ounce be enough. I would use 2 ounces grated extremely fine. I did my laundry detergent for a while( with soap,bak.soda and borax) but gave up .Clothes smelled funny after a while in the closet and I never got rid of the smell of sweat from the sporting clothes from my hubby and daughter. I added essent.oils but did not get rid of the smell of sweat.Any other natural things to add into it to get rid of the smell.I would love to go back to natural . I haven’t had that problem. I’m not sure what else you could try at this point besides soaking before washing. Can you use goats milk based home made soap? Yes, the key for laundry soap is to leave very little superfat content so that no fat is left to clog up your machine. If your goat milk soap is 2-4% superfat then it may make a good laundry soap. Love the simplicity of these recipes! Laundry detergent is very expensive in this area, (northern Canada), and I’m ready to try homemade. 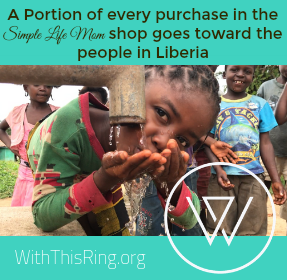 I haven’t seen washing soda here though – may have to add it to my Amazon Prime order! Found you through the Homestead Bog Hop – thanks for hosting, and I love being a part of it and seeing what everyone is doing. Hi. I have your book with the recipe for laundry bars and it says 1 bar and 4 lbs of borax and 4 lbs of baking soda but not how much to use per load. Then when I went to your site, the amounts of borax and soda were only a 1/4 cup. Could you please clear this up for me? This was going to be the next recipe I tried from your book. 1/4 cup to 1/2 cup is enough to use per load.